We all have pivotal moments in our career where we remember them like yesterday. One of mine occurred about a decade ago at a nonprofit and foundation leadership conference hosted by the Humphrey School’s Public and Nonprofit Leadership Center, which I was directing at the time. One of the plenary sessions was regarding the future of our sectors and the necessary components to lead successfully into the next century. Sounds like one of our sector’s conferences, right? In the keynote, one of my mentors, the late Ron McKinley, discussed the imbalance of staff and executive representation compared to clients served by our organizations. In order to make his point, in this room of 800 leaders he asked all people of color to stand. There were seven. Seven. In a room of 800. That’s inexcusable. It left a lasting impression on me. Fast forward to 2017. We are in the midst of another pivotal moment. It’s a troubling time for our communities, marginalized peoples, and our institutions. We are experiencing an attack on human rights and a diminishment of our democratic principles. Beyond partisan differences, we are witnessing a breakdown of justice’s checks and balances that makes our country strong. This is occurring not only in our local community, but across the world. Refugees are banned from entering our country, a wall is threatened to separate us from Mexico, and our communities experience deep divisions between police and communities of color. This moment calls philanthropy’s attention and work – in a dire way. What gives me hope at this pivotal moment is that I think we’re in a different place in our field than we were a decade ago. Major work remains, but we’ve made significant progress in a commitment to furthering diversity, equity, and inclusion issues. Locally there are there are serious efforts underfoot to address equity issues in the philanthropic and nonprofit community. 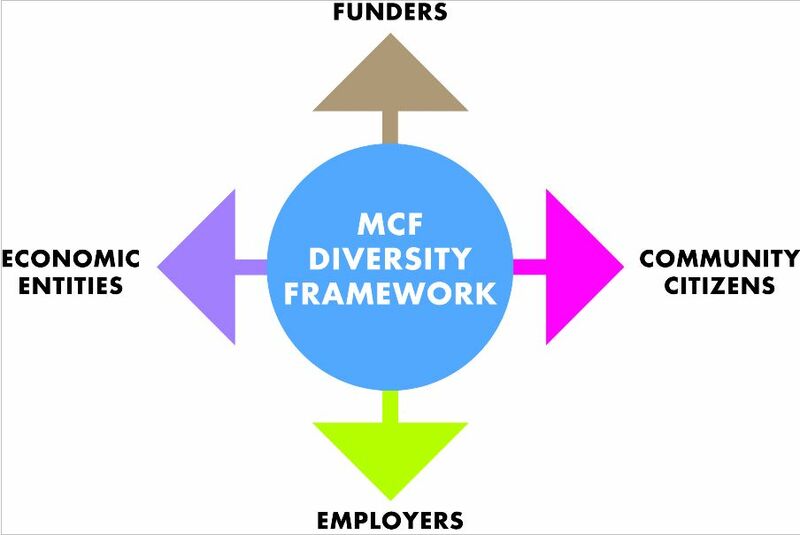 MCF has galvanized many of these initiatives – Ron McKinley Fellowship program, African American Leadership Forum, consulting for foundations to increase their diversity, equity and inclusion priorities. There are also regional efforts that have gained traction. “Make It. MSP, ” launched in 2016 by the Bush Foundation and St. Paul Area of Commerce, is aimed at the retention and attraction of talent to the area, with a big priority placed on retaining professionals of color. The Headwaters Foundation was one of the first grantmakers to make a grant to Black Lives Matter. Countless others have provided leadership and grants to express their commitment. Board governance - The MCF Board of Directors will have a majority of underrepresented communities, with a minimum 30% people of color, 50% women, 10% LGBT representation on the board. Public participation – MCF’s advocacy agenda is to create a more prosperous, inclusive and equitable Minnesota by eliminating disparities through the strengthening of democratic and civic systems. Hiring practices - MCF will ensure that finalist pools include candidates of color before closing applicant outreach. They will also incorporate the cultural competence questions into their hiring process (adapted from The Saint Paul Foundation). Supplier diversity practices – MCF will actively seek a diverse range of candidates when selecting consultants, investment managers, legal counsel, auditing firms and other vendors. The full list and document of MCF’s DEI practices is located here. MCF’s board and committees will annually monitor goals and progress on these DEI practices. We anticipate others will adopt and incorporate them into their work. This signifies a comprehensive approach for the field to fully implement equity efforts into their operations, beyond grants, community investments, and advocacy efforts. It’s a full adoption of equity engagement for organizations. Hope you’ll consider it for your own work! Concurrently the board and strategic planning committee have been working to redefine MCF’s purpose and value proposition to members. At their January conference, we released the work for the future - we are a vibrant philanthropic community collectively advancing prosperity and equity. Even further, MCF commits to lead the field by engaging in civic discourse and public policy action, elevating the impact of philanthropy, and utilizing a future lens to identify and focus on priority issues. The centralization of MCF’s commitment to equity was paramount as we look to the future. This focus ensures an integrated institutional commitment to equity and inclusion, and assisting grantmaking members accelerate their own work in this regard. As leaders of and in philanthropic organizations we play an important role in diversity, equity, and inclusion efforts. Grantmaking is only one tool in the array of change opportunities available to us. It is time to access those tools. The biggest areas of impact we can commit ourselves to are within our own organizations. By incorporating practices of diversity, equity, and inclusion we change the way we do business. A commitment to diversity as an outcome of employee recruitment ensures a broader base of who becomes hired in our organizations. A more diverse work environment ensures voices from community are at the table, robust problem solving occurs, and leads to better outcomes. By committing to working with minority vendors, we are making an economic investment in our communities. By ensuring our benefits best suit employees’ diverse needs, we’re ensuring competitive places of employment. We are in the business of doing good. All of these efforts are consistent with the missions of our organizations. As such, we have a responsibility to lead our organizations with greater actions of integrity. Our value propositions to civil society call us to do so. Plus, it’s darn good business. It’s a serious time for commitments to diversity, equity, and inclusion. It’s our responsibility to stand up and commit to doing everything we can to make our communities – and workplaces – ones that further practices of equity. Now more than ever before.